The first thing you can expect when you take that first step through the door is to be greeted with a smile by the instructor, we recognise that most people are nervous at their first lesson so you’ll be made most welcome. Then the class starts with a warm up, you’ll be training in bare feet and comfortable clothing, depending on the length and content of the class this is normally 5-10 minutes. Then you’ll be taught basic stances, blocks, kicks etc either by the main instructor or one of their assistants. If there’s sparring in the class you would normally watch the other students perform as they will be wearing specific sparring kit. Normally the class will contain fitness and stretching drills which you will be expected to do, things like Push ups, sit ups, Burpees etc, we also normally train with kickshields and hand pads. Taekwon-Do is the scientific use of the body in the method of self defence. A body that has gained the ultimate use of it's facilities through intensive physical and mental training. Translated from Korean TAE literally means to jump, kick or smash with the foot, KWON means to destroy with the hand or fist and DO means the art, way or method. Today, Taekwon-Do has millions of followers throughout the world. It is considered to be one of the most effective forms of self defence when correctly applied, and is also a highly effective way of providing both, mental and physical self development. 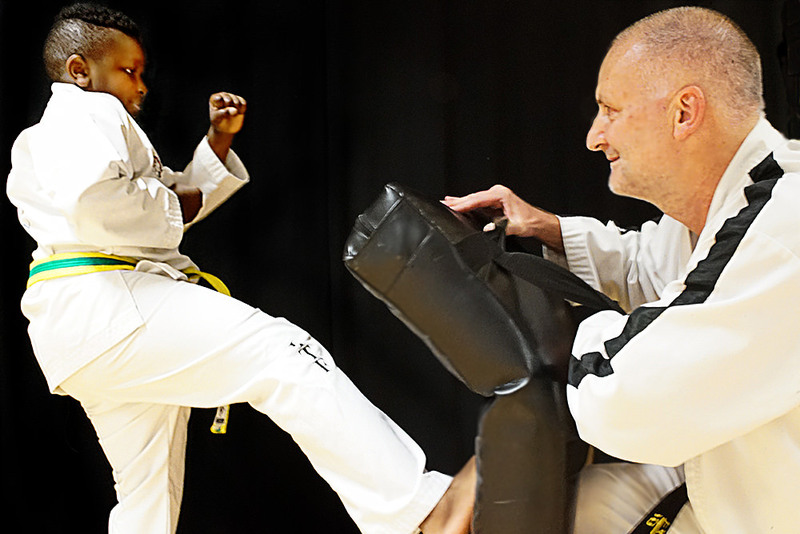 Taekwon-Do is more than just a set of physical exercises. 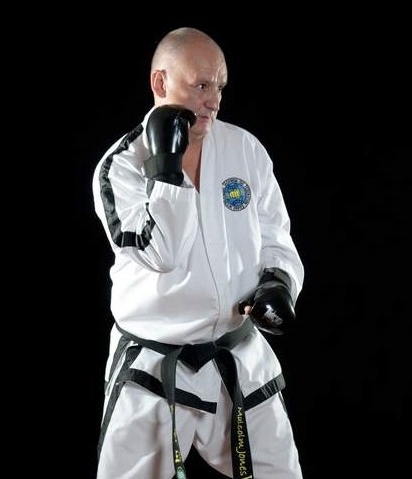 It is more a way of life utilizing the tenets of Taekwon-Do. These tenets help the student to cope with the stress and pressures of everyday life, as well as developing a strong moral code. The best form of protection, no matter if you've been training for a significant number of years in martial arts, or purely a beginner, is awareness. That is to be sensible and alert enough to avoid any type of physical, or indeed verbal confrontation. With this in mind you should have already trained yourself to always be aware of your surroundings at all times. An example of poor awareness is walking through an unlit park on your own, or texting, how many people do you see walking down the street with their gaze fixed on their mobile phone? Think of it like driving a car, the good driver is constantly on the look out for a cyclist to pull out of a blind junction, or a child to run out in the road near a parade of shops or the driver on the motorway who pulls out in front of you with no warning signal. Therefore the careful Taekwon-Do student is constantly monitoring their situation/surroundings. Although you can learn many self defence skills in a relatively short period of time, the key to utilising them comes from your state of mind. Confidence, calmness and having the ability to think clearly under the stress of a possible attack are the essential elements in successful self protection, for more practise ask to go on one of our adrenal stress courses. Can I take part in competitions? 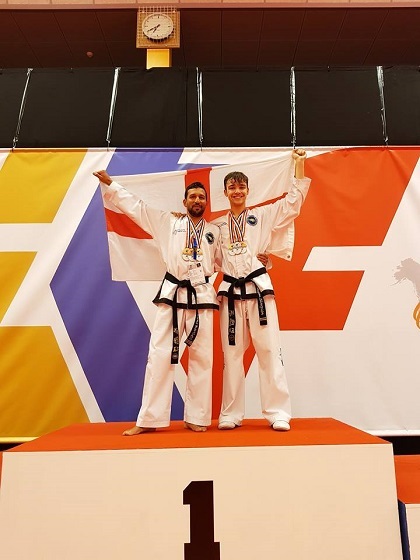 The Taekwon-Do network holds local, national and international tournaments all throughout the year for students of all abilities to test out their skills in the sporting arena, most tournaments are open to students who have attained a yellow stripe or higher, so you can start competing after approximately three months. Most tournaments consist of the many Taekwon-Do disciplines including sparring, patterns, breaking, weapons musical forms and junior high kicking contests. All divisions are made as fair as possible by separating all grades, weights and heights etc. The tournaments are great places to make and maintain friendships. Who takes the classes and what will I do? All the classes are taken by Master Malcolm Jones VII Degree and Mr Richard Winton VI Degree. With many years of teaching experience behind them, rest assured that they will help you to achieve your own personal goals. Sparring, line work, pad drills, pattern practise, self protection work, fitness drills and strategies. Sometimes the classes mix beginners with the more senior grades, everybody helps their fellow class mates to have an enjoyable session. At Integrity, we pride ourselves on achieving the very highest standards of martial arts, but we also like to have fun. You can regularly find us training down the beach in Poole and Weymouth in the summer months having a great time, the water there is very shallow and perfectly safe, so that the kids can come down and join in the fun. The adults normally spend the rest of the evening socialising on the beach itself or in one of the many venues in the area. There are various camps available throughout the year, and we constantly arrange social events for everyone. Martial arts are for anyone who wishes to learn, no matter what age, for the really young we have classes, designed for the 5-6 yr olds, then we have junior classes for the children aged 7-12. Teenagers and adults, both male and female train in the same class. Our oldest student was in his 80's. 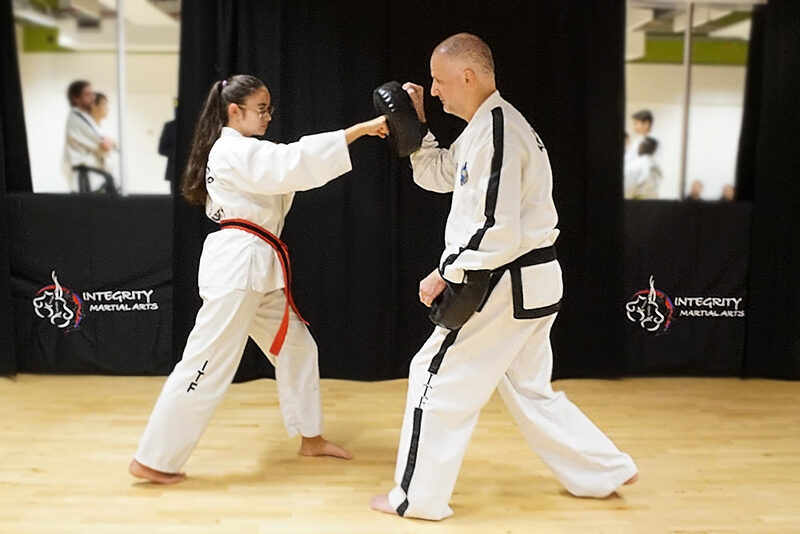 All our schools are friendly and the classes are designed so that you will quickly settle in and they are tailored to your level of fitness and ability, so you will be able to train at a level that suits you. Come by yourself and make new friends, or bring a friend and become training partners. Gradings are the method of a students progression in Taekwon-Do, at first they take place every 3 months, until reaching blue belt, from there until black belt they take place every 6 months. If a student is competent enough, trains hard and takes all their gradings on time, then the period from start to black belt is approx 3 1/2 years. We are lucky enough to have access to some of the best male and female examiners in the UK. These senior grades have been practising Taekwon-Do for well over twenty years, so rest assure you're going to be tested by the best. Once you have gained your black belt, you are known as a 1st Degree, but this does not mean you are an expert, indeed the first 3 black belt grades are known as 'novice grades' with 4th, 5th and 6th Degree's being 'expert grades' you do not call yourself a 'master until you have reached 7th Degree. What benefits can I get from TAEkwon-Do training? People take up Taekwon-Do for many reasons. As well as the benefits of learning a form of self defence, listed below are many of the benefits of getting involved in Taekwon-Do. Exercise has been proven to slow down the ageing progress. Taekwon-Do can burn over 800 calories per hour, that's twice the amount of an aerobics class. Great discipline, and positive role models for adults and children. Gain increased flexibility and improve your blood circulation. Forget about your worries 2-3 times per week with great stress busting classes. Gain a new circle of friends. Develop or improve your confidence. Learn something that you can practise for the rest of your life, Taekwon-Do trains the mind and spirit as well as the body. Why do we need to know the Korean terms? Simply because if you move to a different part of the world, then you can still train with the universal language of Taekwon-Do, also if we're not careful all the old traditions will be lost forever. Will I be asked terminology questions at my grading? Yes, questions can range from philosophy, pattern meanings, Taekwon-Do techniques, Korean history and terminology.